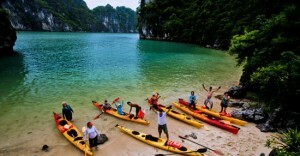 Twenty-two years ago, I led a ragged bunch of North American kayakers into the stunning 3,000-island archipelago of Ha Long Bay on the first-ever exploratory sea kayaking expedition in these waters. In other words, it was one of those “we don’t know what the heck we are doing – but we will do it anyway” trips! And to be frank, it was also the movie Indochine, starring the gorgeous Catherine Deneuve, with the alluring seascapes in the background that provided us with easy stimuli to embark on this adventure. We set out from California, flying our folding kayaks across the Pacific to Vietnam, where we then built them in a dingy communist backyard, tied them onto roof of a rusty bus and pointed at the driver to get us to the shore where a Chinese junk follow-boat awaited us. The captain was a former Viet Cong navy sailor – and all we had was a half-page, badly printed tourist map of the vast Ha Long Bay before us. 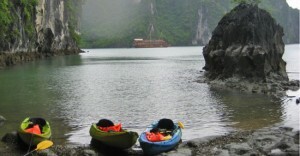 Paddling Vietnam’s mystical Ha Long Bay. When I asked the captain whether he had a chart, he pulled out a perfect CIA-stamped navigation chart and offered me the opportunity to take a look at it – at one dollar per viewing! At that moment I knew Vietnam was on the entrepreneurial pathway to capitalism. But what I remember most was a sunny afternoon paddling along a slender slice of beach on the outer edge of the archipelago, facing the China Sea. The beaches of Ha Long Bay are covered with fine milky-white sand from the limestone rocks, but this particular beach was littered with plastic and the typical garbage you now find on most of the world’s beaches that lie near population centers. This particular pollution was a stark violation of the magical and serene karst limestone seascape, an ugly contrast to the small Buddhist temples where fishermen brought offerings for safe sailings, and the many swallows doing cartwheels in the sky above us. Frustrated, I went ashore and was attracted to a piece of refuse — a red, glittering ball. I picked it up and realized it was a shiny Christmas tree ornament! I wanted so much to camp here with the group on this narrow, beautiful strip of beach – but how could I invite them to do that with so much trash around? I paddled back to our supply boat, ornament in hand, and gathered the crew and clients to explain the situation. The sailors offered an empty stare when I explained how we liked to have a non-polluted experience. So, I and the clients grabbed a couple of rakes and starting cleaning the beach for our campsite. Soon, we pitched our tents and enjoyed a classic crimson sunset overlooking the China Sea from a clean beach. The next morning the crew came back to us in the dinghy, and I again explained to them why we cleaned the beach. 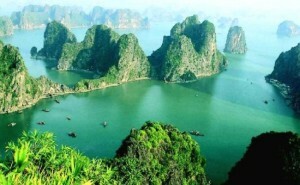 “We do this because we appreciate pure nature – and when we come home and tell our friends about the beauty of Ha Long Bay’s beaches, they will come here as well. And many more after them. It did not take much for our Viet friends to see the link between environmental stewardship and immediate income for their families. So, miraculously, when we paddled the next day to another pre-arranged beach camping location, it had already been raked clean by our converted friends! For me, this was a clear, hands-on example of the logic that contends that environmentalism pays off — it also makes sound economic sense. For years to come, my message for our clients and locals alike has been to show this by example – that taking care of the natural environment makes aesthetic, moral and economic sense. And thus, environmental stewardship has very naturally become one our fundamental values at Natural Habitat Expeditions. P.S. You can still visit Ha Long Bay on our Indochina kayaking expedition – we now know exactly where we are going, and we’ve perfected an exclusive and captivating itinerary.